Fifteen-years ago Runnymede Borough Council agreed to a "horse margin" along Bishopsgate Road. There were several small posts along the road indicating the “ horse margin”. Today only one remains in view. All the rest have either been removed or are now over grown. 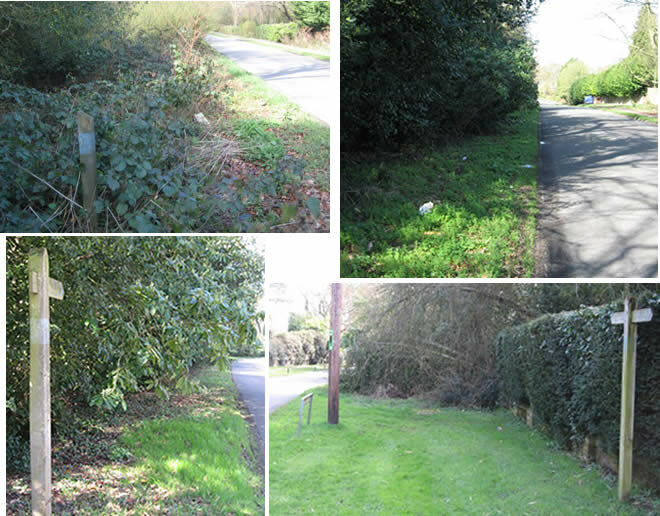 Runnymede Borough Council also agreed to keep the “horse margin” clear for horses. It is no longer being kept clear for horses. Runnymede Borough Council. You are letting horse riders down and making them ride on a busy 60mph limit road. 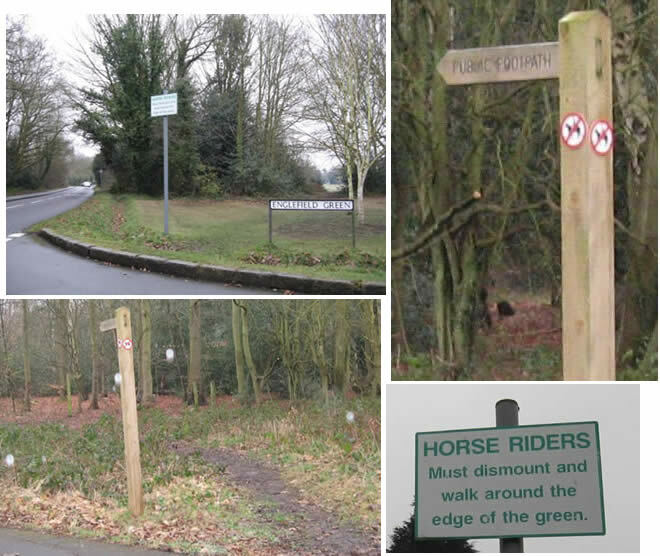 These horse signs on Englefield Green Common in North West Surrey, near Runnymede, are ILLEGAL. Englefield Green Common, is a registered village green. It is also a 'Section 193 Common' [S.193 of the law of property Act 1925] so, since the Billson case [R v Secretary of State for the Environment, ex parte Billson] , the public have a right of access for 'air and exercise' over the whole of the common on foot and on horseback. This means that as long as the rider is, himself, taking exercise on the horse [and not exercising the horse, eg lungeing or long reigning it etc], and not otherwise breaking the law, no one can stop him riding anywhere on the land at whatever pace he likes. Apart from the roads, there are two highways, in this case, footpaths [ie a right of way on foot] across this land. These are footpaths across land that has a pre-existing right of access on horseback. A right of way on foot does not exclude access on horseback if it is lawful on the land. This means that in this case, the rider, if he wishes, can ride on or across the footpath. 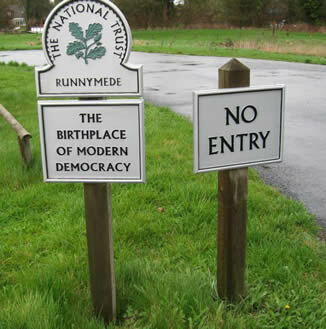 The owners of Runnymede Common, The National Trust is breaking the law. 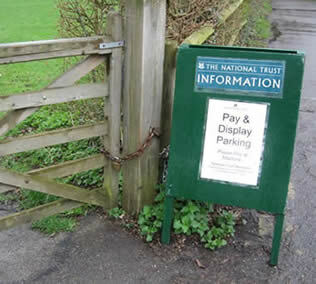 The National Trust is preventing riders from riding on the Common. Runnymede Common is subject to the Egham Inclosure Act 1814. The Act says the Common "..shall not be fenced or inclosed ...but the said Meads shall in all other respects remain at all times hereafter open and uninclosed..."
Nothing could be plainer than that. Under S.193 of the law of Property Act 1925, the public has the right for air and exercise on foot and horseback over the whole of the Common - every square inch. 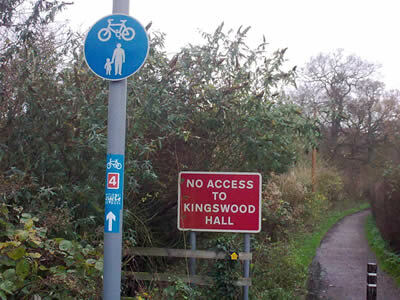 But the National Trust is stopping people from riding on the Common. “12 (a) No unauthorised person shall ride a horse on any part of Trust Property where horse riding is prohibited by an authorised notice or where horse-riding is likely to result in damage to trust property whether prohibited by notice or not. These bylaws apply to all The NT land, including the Common. It is not illegal to have these bylaws as long as there are no 'authorised notices' prohibiting horse riding on the Common - but they might put people off riding on the land. However, there are several illegally locked gates preventing riders from accessing all the Common. National Trust. You are breaking the law. Remove all those locked gates. But wait a minute. That’s not all. 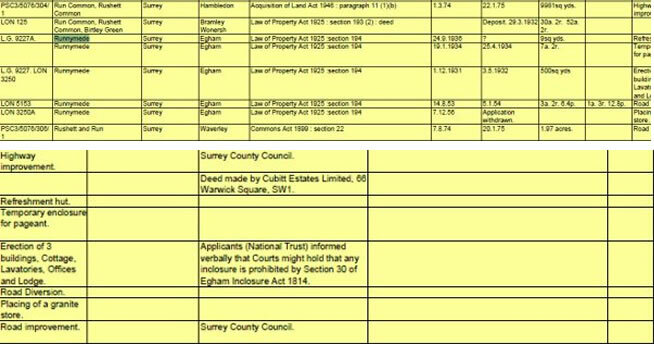 The Defra documents, which clearly show Ministerial consent has only ever been obtained for 3 buildings. Not fencing, gates, or tarmac car parks and tracks. None of the tarmac in the two car parks on the Common, none of the car parking machines and none of the fencing and gates are legal. As far as the car parks themselves are concerned, since Attorney General v Southampton Corporation , they need Ministerial consent. 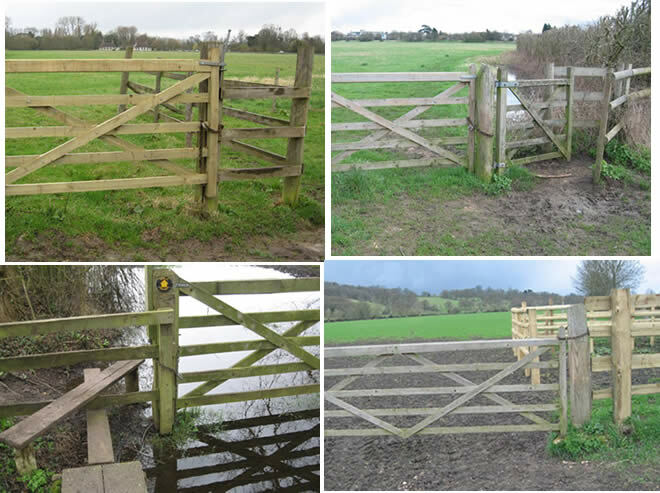 As DEFRA Common Land Guidance Sheet 5 emphasises, unauthorised works completed before 1/10/07 cannot be authorised by S. 38 of the Commons Act 2006. Furthermore, it is now too late to make retrospective S. 194 applications. or remove the unauthorised works, and reinstate the land to open common. Will the National Trust be prepared to do that? On the other hand, National Trust , we could do a deal. 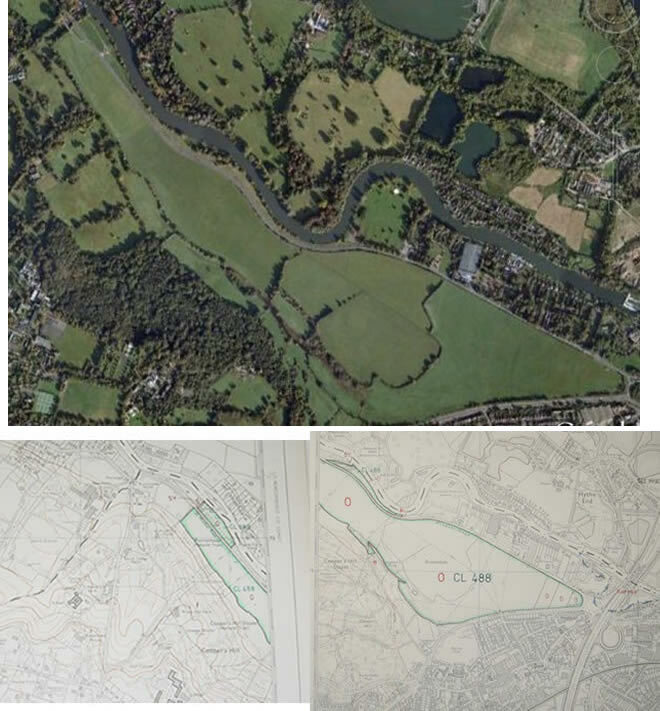 We wont tell Defra what you have been doing – if you open up Runnymede Common for horses and riders? What's more, could you please tell Surrey County Council to take down the illegal Surrey CC Highway authority blue roundels stopping horses accessing Coopers Hill ! There is no record of any stopping up of the carriageway for equestrians. There was a highway from Coopers Hill Lane to the common which is shown on the Inclosure award plan. This has been fenced off by the National Trust. This would make a reasonable circular ride with the common for all those horses on Priest Hill. But it is no longer possible. Is your local authority breaking the law? Is it failing to maintain bridleways? Is it refusing to allow you to ride on land on which you are entitle d to ride? Is it failing to maintain bridlegates?